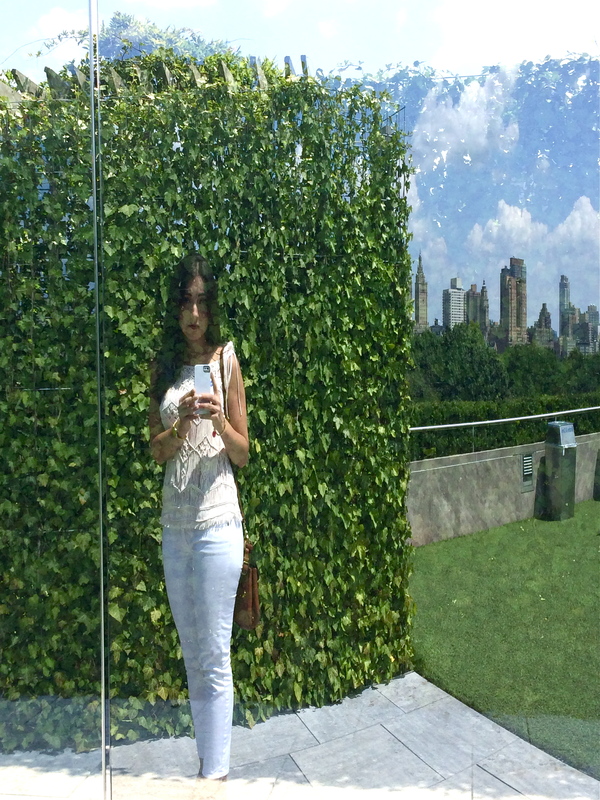 Just when I thought I’d seen the Manhattan skyline from every possible angle, in every time of day, transformed by every available Instagram filter… Dan Graham and Günther Vogt install their “Hedge Two-Way Mirror Walkabout” on the MET’s rooftop garden. 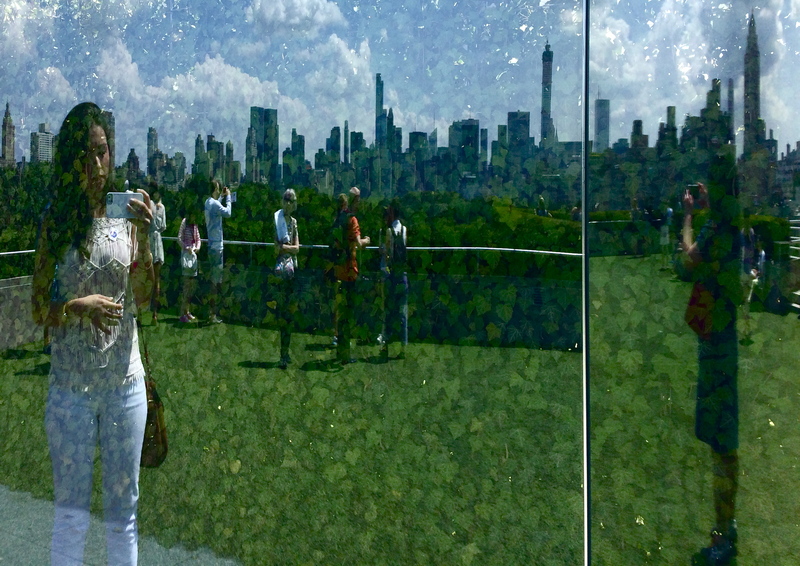 It’s a skyline I’ve seen a thousand times, from the rooftop of a museum I’ve been to a hundred times… but this experience was different. Partly because I was there on a first date – and if you know me, you know I hate dates. But mostly because I had never been to a location in New York City quite like this one before. The American artist and Swiss landscape architect have designed an innovative space that seamlessly merges a modern urban landscape with elements evocative of an 18th-century Victorian garden, presenting visitors with a series of contradictory views. As you push through the glass doors and step on to the artificial turf of the roof garden you are welcomed into a pleasantly shaded passageway created by a wooden trellis, intertwined with blossoming lavender wisteria vines that hang directly overhead. From this peaceful haven, a rare find in NYC, you’re instantly entranced by the breathtaking view ahead: an endless blue sky and the billowing green trees of Central Park. Running across the horizon, like a zipper binding the edges of these two vibrant planes, is the Manhattan skyline – the buildings merely peeking above the greenery, subtly poking at the sky. To the right of the trellis is Dan Graham’s roofless pavilion. So what is it exactly? 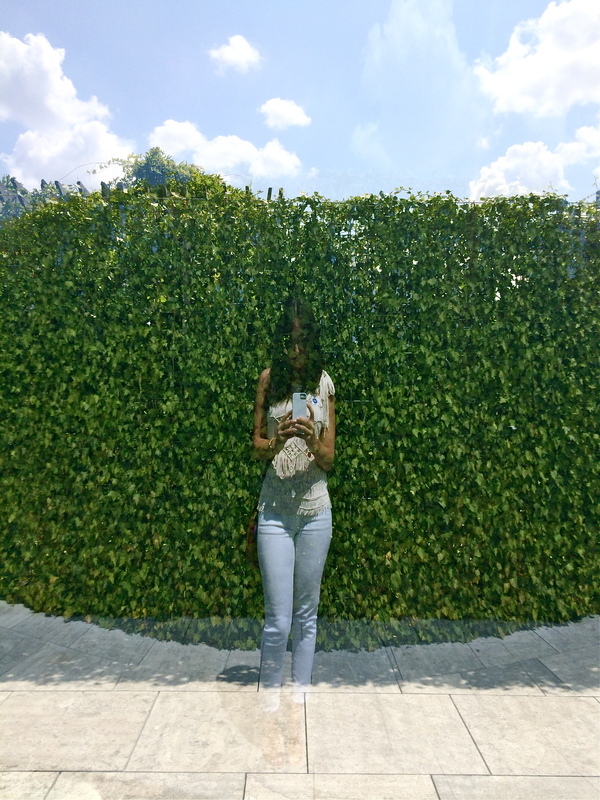 Basically, the installation consists of a swerving glass mirror that is supported by a steel armature and book-ended by two ivy-covered walls. You’re invited to venture into the two sections of the pavilion and catch glimpses of yourself and your surrounding environment in the two-way mirror. Since the mirror is curved, the reflection is distorted, like in a funhouse. Good thing, because the 450 lb version of myself is sca-ry. As you move towards the outer corners of the pavilion and peer into the glass, you’re suddenly struck by an awe-inspiring view. The same buildings that a moment earlier seemed faraway, short, and squat are in an instant transfigured into glinting steel skyscrapers that fiercely soar to the sky, brazenly pierce the Manhattan skyline, and ominously loom over you. It’s a drastically different view compared to the one from earlier, but one that in my opinion more accurately reflects the sometimes overwhelming sensation you’re filled with when walking through the streets of this concrete jungle. Like I said earlier, I’m not a fan of dates. Especially first ones. Not that I haven’t been on great ones, but let’s face it, it’s rare. For the most part they’re awkward and uncomfortable, I either talk too much or too little, and chances are I will probably spill something. Ok, maybe not. But I still think they’re awkward. 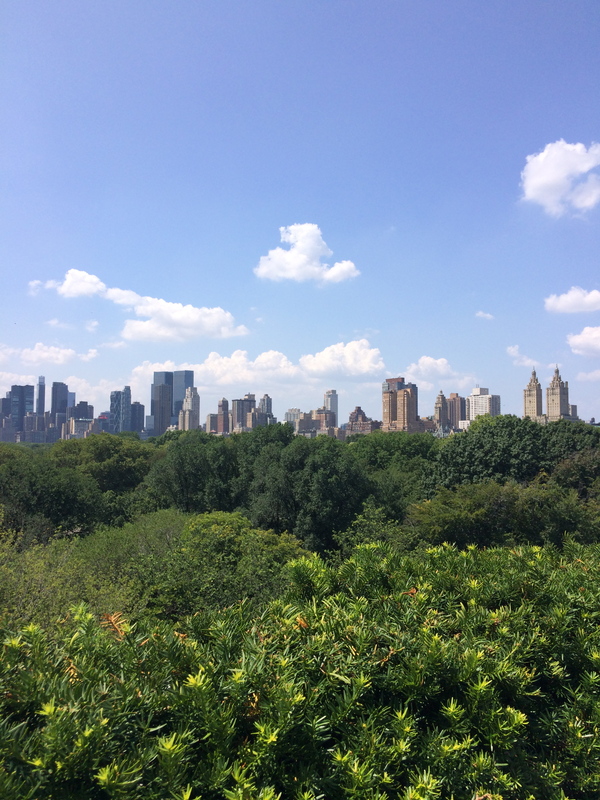 Needless to say, I had different expectations before going to the MET’s rooftop. I mean… it’s the MET! I expected a stuffy atmosphere and people with their pinkies in the air while sipping on champagne. A terrible place to spill something. I was way off. It turns out that it’s a casual, low-key place to go with someone you’ve just met, hang out with friends, or even relax by yourself. There’s a bar, but no tables or chairs, so you just get a drink, pick a spot on the grass to sit, relax and enjoy the view. 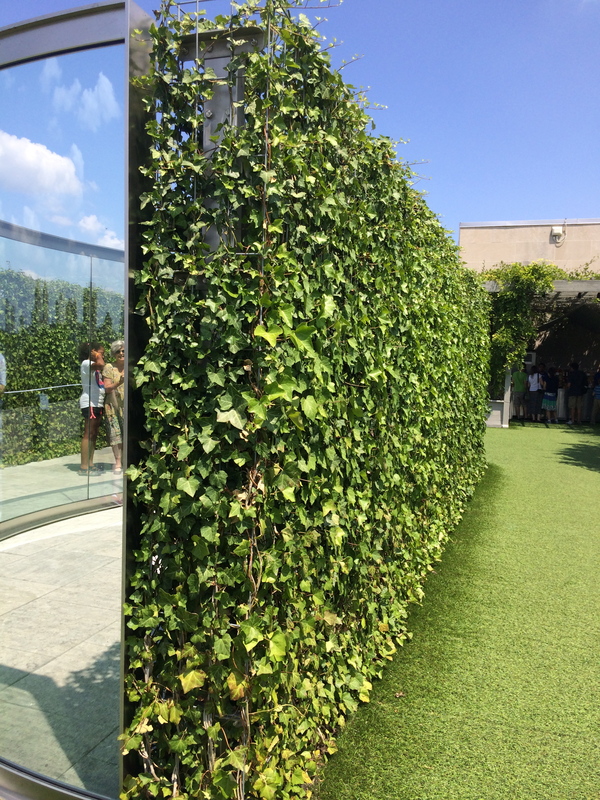 Last year the MET decided that each summer they would commission an artist to transform the rooftop garden. This year’s installation, a far cry from last year’s provocative, bomb/blood-inspired floral garden, is only the second in the series. The pavilion is on view until November 2nd so if you’re looking for a temporary escape from the chaos of New York City, or a quiet place to reflect, I’d definitely recommend stopping by!